The Church of St Andrew occupies a site on the edge of Oddington, in the area of the former medieval village. No other buildings from this period remain, but their outline can be seen in the field behind the church. The fishponds which were in the grounds of the houses still remain. From the churchyard there are magnificent views across Otmoor to the hills beyond. A Cistercian monastery was founded at Oddington in 1137 and is thought that the church was in existence at that time. Local legend is that the monastery was close to the church, although the more accepted version is that it was about half a mile to the north, at where is now situated Oddington Grange. The monks are said to have found the area too wet for their liking and the following year they were relocated to Thame Park. However, the order retained the land that was attached to the monastery. The building appears to have remained as the Bishop gave consent for Thame Abbey to continue to hold services at Oddington, providing the parishioners were excluded. The first recorded rector was Roger de Turberville in 1222, who was said to be of noble birth. Up until the 15th century the rectors were usually under the patronage of the Lord of the Manor. There then followed a period when rectors were university graduates. Ralph Hamsterley (1499-1507) was a Fellow of Merton College, Oxford, and later Master of University College, Oxford. His legacy to Oddington is the “Hamsterley brass” which forms part of the floor of the chancel. He appears to have commissioned this brass during his lifetime to commemorate his death! It depicts a skeleton, wrapped in a shroud, with worms crawling out from various parts of the body. The brass is of national repute, and attracts people to the church to carry out brass rubbings. The appointment of graduates had the disadvantage of some of them being appointed to more than one parish. Was of these was Gilbert Sheldon, who was instituted as Rector of Oddington in 1636, his patron being King Charles 1. He was a prominent Royalist and took part in negotiations with the Parliamentarians in an attempt to end the civil war. He was appointed as Bishop of London in 1660 and Archbishop of Canterbury in 1663. By the early 1800’s, the Rectory, which was close to the church, had become seriously dilapidated and was said to have been reduced to housing livestock. The decay may well have been due to a period when it was not occupied by the rectors. In the 1820’s a new Rectory was built on the outskirts of the village. 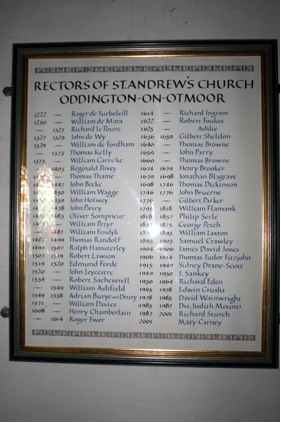 A major change occurred to church life in Oddington in 1915, when Rev. Sidney Herbert Drane-Scott was appointed as Rector. He was a member of St John’s College, Oxford and a leading Anglo-Catholic. It was said that he was “a thorn in the side” of the Bishop of Oxford, who appointed him to the Oddington living to get him out of his way. He brought with him his followers from Oxford, local parishioners by and large deserting the church. Dr Scott (as he was known) transformed the interior of the church. At his own expense he acquired numerous paintings, statues, chandeliers and other ornate objects (many of which were sold in the 1990’s to raise money for the upkeep of the church). The chancel and Lady Chapel were painted pink and blue. Dr Scott remained in post until his death in 1949. In his memory his friends restored the Preaching Cross in the churchyard. The restoration included the fixing to the plinth of a head, an ancient stone obtained from elesewhere. Whilst the entire structure cannot be said to be original, it is nevertheless the only complete cross in Oxfordshire. The chancel and Lady Chapel were redecorated in early 2000 but not in totally accurate colours and the paint used was not compatible with that used for such an ancient building. The bell tower is accessed by way of an ancient ladder, believed to have been constructed at the same time as the tower. The tower contains a ring of three bells, Dated 1609, 1626 and 1804. They are contained within an oak frame, dating from the mediaeval period. There is also a Sanctus bell in the roof space.